Getting back in the middle school classroom is like putting on a favorite pair of jeans to me. It’s comfortable and I know it fits me just right. Yesterday gave me a wonderful opportunity to teach at Hopewell Junior School and 7th grade teacher Tracey Parks’ class. Tracey had just finished teaching our lesson from History Alive! The Ancient World on Alexander the Great. Her students would begin a study the legacy of the Ancient Greeks. Students then had an opportunity to explore the essential question as it related to the chapter opener…but not before my big hook. A great feature of TCI’s award-winning software allows teachers to customize the presentations and make it their own. 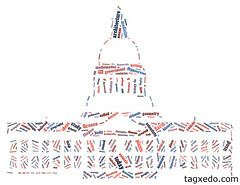 I took liberty and added an image of a word cloud in the shape of the US Capitol building. To generate this word cloud, I was able to copy/paste the entire text of the coming chapter students would read into the website http://tagxedo.com. Once I had my word cloud saved to my Flickr account, I grabbed the URL of the image and pasted into my custom presentation. As students came forward I had them reach out and look for words that were familiar to them everyday. Students loved the opportunity to get out of their seats and shared lots of key words they would soon discover had ancient greek roots. Students then read their chapter opener and began a great skill builder activity where they worked with a partner to read about a portion of modern life, look at greek artifacts linked to the topic, and read a portion of text relating the two together. Tracey was not just a passive observer to this. She is a master teacher. One of the things we discovered and used with the students that I’d like to pass along to our subscribers had to do with her IWB (interactive white board) and annotating images. During parts of lessons, teachers oftentimes like to call up portions of student notes or previews and either complete them as a class or simply model for the students. Tracey discovered that if you click on the magnify tool on the thumbnail images and enlarged the portion of the image she wanted her stu dents to annotate, she could then use her IWB’s built-in tools (she was using Smartboard tools) students could mark up the image and she could save the ink-layer as a screen shot to share with students who were absent or needed to see that example later. I thought this was a fantastic example of the marriage of good technology and pedogogy. Though I was nervous getting ready yesterday to teach, once I got back in the classroom and got my mojo going, it felt like those jeans to me. Everything felt right about it. I’m looking forward to more visits throughout the year in my old district as we test out our customized Ohio program for 7th grade.